After a lovely wedding in the town park in Lakeport, California, the crowd traveled to nearby Kelseyville for Chris and Devona Hunt’s wedding reception. A banner proclaims the occasion. ••• Chris and Devona. 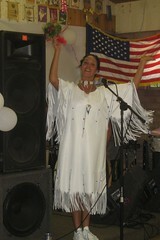 ••• Devona prepares to throw her bouquet. 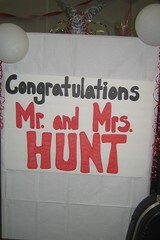 Click on any photo to see a slideshow of the highlights of Chris and Devona Hunt’s wedding reception. If info about the photos is not displayed in the slideshow, click Show Info. 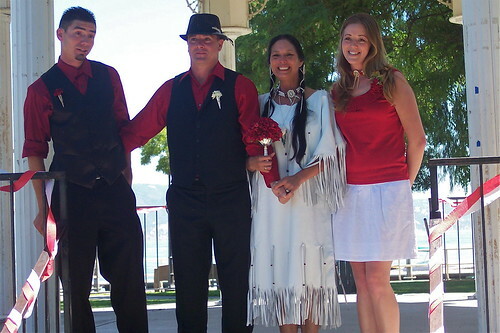 On July 31 families of Chris Hunt and Devona Boerema, along with numerous friends, gathered in Lakeport, California, to share their marriage ceremony and reception with them. Chris’s mother Mary (my sister), and some of our other sisters, Joyce Ann, Barbara Jean, Nancy Lynne, and I and two of my nieces, Melissa and Nancy Carol, met in San Francisco for two days of sightseeing before driving to Redding, California, to visit overnight with Angie (Sunnie), who is Mary’s daughter. The entire crowd then drove to Lakeport for a weekend of fun, the wedding being the main event! Here Chris and Devona are flanked by her two children, Daryl and Melissa, who participated in the ceremony in a gazebo in the lovely lakeside park on Clear Lake. 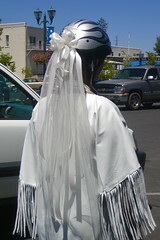 To view a slideshow of all the wedding photos, click on one of the photos. If info about the photos is not displayed in the slideshow, click Show Info. Off to the reception. 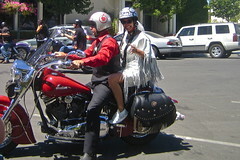 Chris and Devona ride their Indian motorcycle to the reception in nearby Kelseyville. 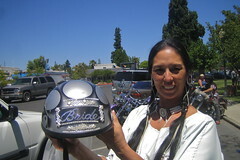 Devona’s friends created a proper helmet for the bride!